Major operators and innovators gather in Abu Dhabi for ITF members’ meeting. The CEO of global leading energy services company LR Senergy, James McCallum has issued a stark warning that oil and gas productivity will drop if the drilling sector doesn’t unite and take urgent action to tackle the drilling skills shortage and focus on excellence in well delivery processes. Speaking at the Industry Technology Facilitator’s (ITF) Bi-annual Members’ Forum meeting on Wednesday, April 23 in Abu Dhabi, Mr McCallum hosted a debate on drilling challenges and initiatives. He highlighted that highly skilled engineers are needed now more than ever to execute drilling on complex, high risk projects such as Shah and Bab sour gas developments in the Middle East, but with 50% of petroleum engineers due to reach retirement age in the coming years, concerns are rising about the potential impact of a lost generation of talent. Mr McCallum said, “Concerns are rising that the exit of senior drilling talent will be accompanied by a drop in productivity as new entrants are likelier to make costly errors, operate at a slower pace and extract lower yields from more challenging deposits due to a lack of experience, resulting Incremental non-production time (NPT) and inefficient operation. “The set of skills required for drilling engineers in the region is changing, in particular on the type of high-risk projects, where specific skills are required to identify any potential hazards. Risk judgement is very important at a time when the drilling risks become significantly higher as geographically difficult and more complex mature oil and gas fields are being exploited. Enhanced oil recovery rightly gets a great deal of attention, however incremental oil recovery from efficient and effective drilling operations should be the immediate priority. ITF’s meeting was attended by the organisation’s membership of international operating and service companies as well as technology specialists who were given a platform to showcase latest developments. The drilling challenges debate heard the views of senior industry experts from NOCs, IOCs and major service companies. Initiatives to attract new talent to the industry, accelerating training programmes and launching drilling centres of excellence are among the actions being pursued by the industry to stem the challenge. The two day Bi-annual Members’ Forum was hosted by ADMA-OPCO and attended by more than 60 senior international oil and gas company representatives. 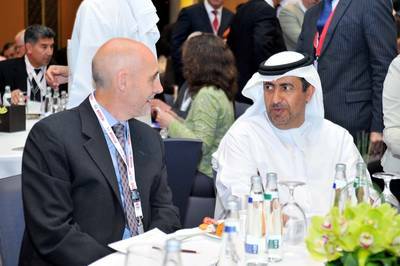 ITF established a base in Abu Dhabi in 2012 and launched the Gulf Cooperation Council (GCC) cluster to help establish a vision for collaborative oil and gas technology research and development. The agenda included updates from technology developers from ITF’s emerging project portfolio as well as interactive facilitated discussions on key themes including enhanced and increased oil recovery.